Originally from Colorado, I’m now based in the San Francisco Bay Area. I offer training plans for triathletes, runners, and swimmers seeking personal growth through self-defined challenges, whether those involve races (e.g. Ironman 70.3, 50K trail runs) or solo adventures (e.g. fast-packing, mountaineering objectives). Learn more about the training approach in my book, “The Triathlete’s Training Guide,” and check out alpfitness.com for additional videos and articles to help you train smart. Adam Hodges, PhD, holds credentials from USA Triathlon and the American College of Sports Medicine. He began running in his youth and racing triathlons in high school. He enjoys passing on the knowledge and experience he has gained over the years to both new and experienced athletes seeking to maximize enjoyment, competitiveness and longevity in endurance sports. As a USAT All-American triathlete, he competed in the ITU World Triathlon Championships, the ITU World Duathlon Championships and the Ironman World Championships in Hawaii. As a masters runner, he won a series title in the XTERRA SoCal Trail Run Series. 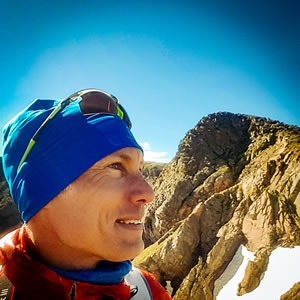 His current pursuits include trail running, climbing, mountaineering and cross-country skiing—he recently ran around Mont Blanc, summitted Mount Rainier and did the Mount Everest Marathon. He coached masters swimmers in Colorado for over a decade, coached high school cross country and track runners in California, and currently coaches masters swimmers and triathletes in Menlo Park. Adam’s training approach is summarized in his book, “The Triathlete’s Training Guide.” He believes that the ultimate reward of training is the continual process of self-discovery and personal growth that arises out of athletic challenges. Visit alpfitness.com to learn more! Athletes should share the Alp Fitness vision and (recommended) be familiar with Adam’s training approach as outlined in "The Triathlete’s Training Guide." Using a HR/GPS device is encouraged. Success. Coach Adam Hodges has been notified of your message.